This plant was found in a bargain bin, looking very small and insignificant, and without a label, though I suspected it was a Euphorbia. 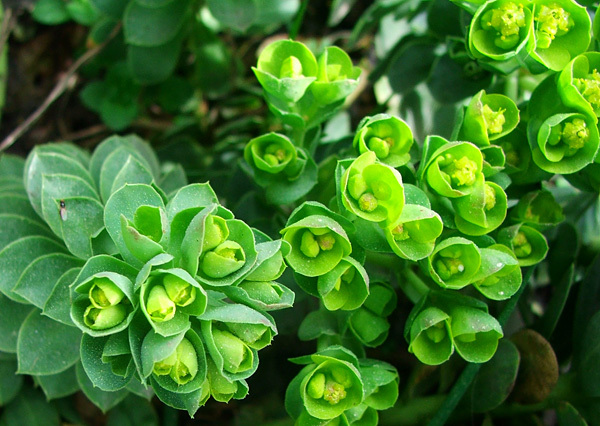 It was later correctly identified by Nicola Rubin as Euphorbia Myrsinites. I planted it under the back fence, and started to worry. Would it survive the winter frosts? How big would it grow? The chains of bluey green leaves reminded me of a succulent, and I didn't totally trust the fence to give enough frost protection. Now years later Euphorbia Myrsinites is still sprawling outwards, and the tips of its leaves have a pinkish flush. It's taken on a slightly grotesque Dr Zeuss look. However, I will forgive this Euphorbia for being a little scruffy, simply because it is a Euphorbia, and this is a plant group which I'm trying to get to know better. 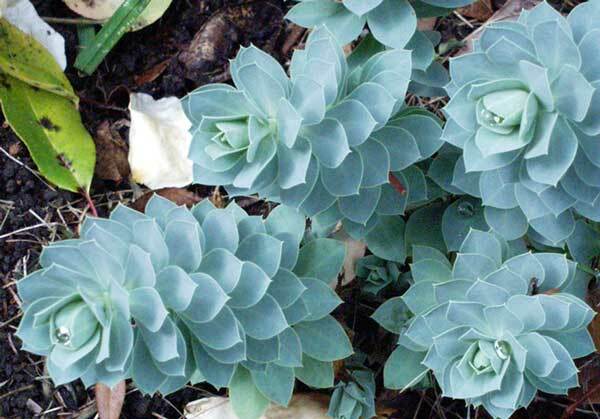 As foliage plants all Euphorbias have subtleties, and nothing seems to eat them.